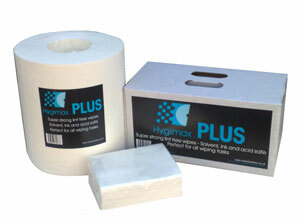 New HYGIMAX™ PLUS is a low static highly absorbent lint free wipe. Made from a technology advanced tear resistant fabric making it ideal for cleaning any surface. Designed for the quick removal of all types of fluids including MEK and solvents. Its cloth like feel and highly absorbent structure makes it perfect for all wiping tasks. Pure WHITE so dirt and soils can be seen easily. Hygimax cloths are lint free meaning better effecieny and fewer reworks. Available in a carry handle dispensing box or large wiping roll.